Is it a café? Is it a patisserie? Is it a restaurant? Is it a deli? No! It’s… all of the above, actually. 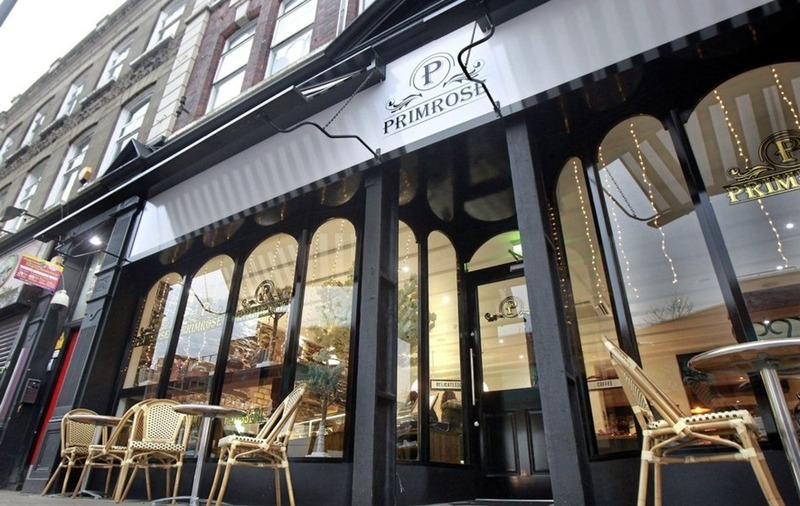 If you’re going to open a new eating place in Derry these days, you’ve got to be good and you’ve got to be brave, because the competition is fierce. And when that decision involves closing a place that’s proven and popular, you have to have extra quality and courage, because people will be both sorry to see the old one go and especially demanding of the new bod. Oh, and you’ve got to get everything right from the word go, as there are too many excellent restaurants to give one a second chance. 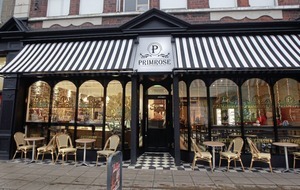 No pressure then on the latest from the Primrose stable, which opened on the Strand Road just as the Carlisle Road branch closed. This place does everything, opening for breakfast first thing in the morning and staying going for lunch and then dinner, with coffee, tea, cakes, and a deli for those nibbly moments in-between. The cakes, incidentally, are unlike anything else I’ve seen in Derry – exquisite patisserie creations, with no sign of a jammy joey anywhere. Three of us tried the place out for dinner. First thing to say is that you can get a little bit of a false impression from the outside at night, because it sort of looks closed, or at least empty. The café and deli side of the set-up is at the front and kept a bit darker in the evenings. Don’t be put off though, because there is a terrific restaurant beyond. It all feels all quite continental inside – the café section is rather French, while the restaurant is feels like more of a bodega, possibly because of the arches that feature to either side of the central bar. I’m not sure what type of cuisine you’d call the menu. All I know is it’s very tempting and decidedly delicious. Three lovely starters kicked us off. The mussels were sweet and fresh, and given a salty kick by the ham hock. The onion and cheese tart – I think you could say it was 'deconstructed' – was creamy and rich with lovely, crisp pastry. One fault for me, though: it was served at room temperature; a bit of heat through it would have made it even better. Then there was the fascinating salad of sweet carrot, sharp orange, crunchy chickpeas, and uplifting coriander. Hard to pick the best of the main dishes. The chicken breast was perfectly cooked – juicy and tender – with salty bacon, earthy mushrooms, and a lively parmesan veloute. The venison cottage pie was a knockout. The potato was beautifully crisp and then smooth as you like, while the deep, rich, powerful venison transformed a teatime favourite into something extra special. I wasn’t so fussed about the accompanying vegetables, mind. The chestnuts overpowered everything else, and the texture was a bit unsettling. Everything about the hake was just brilliant, however: Beautifully crisp skin with soft, melting, meaty flakes beneath, with a sweet tomato stew featuring a spicey but mild merguez sausage. 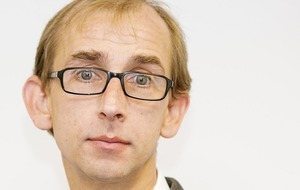 Just faultless. A word about the sides – fantastic chips and a properly creamy champ, but the carrots seemed to have too much honey and butter on them, and would have been better roasted for a subtler kind of caramelisation. We fought over the puddings. The mince pie was rich and fruity and grown-up, with a light, crisp case and a nicely balanced whiskey and caramel sauce. The passion fruit and coconut cheesecake was sweet, sharp, creamy and refreshing, while the lemon cream was a rainbow of flavours, tones, and textures – full of fun and colour and lightness. 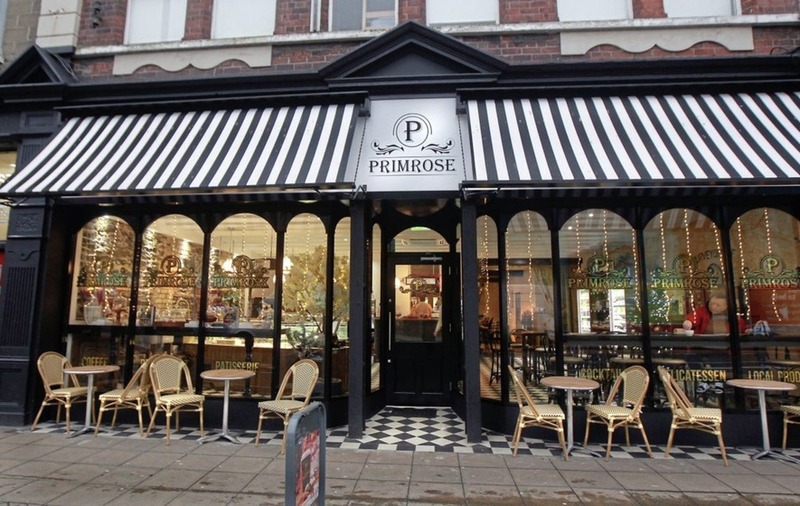 Guts and ambition drove the creation of this new Primrose, and the owners and chefs deserve every credit. This was an absolutely delicious meal, served in a restaurant unlike anywhere else in the city.